David Bazan and the Passenger String Quartet. On Saturday, my husband and I met up with some friends who were in town from South Bend to see a singer-songwriter perform a concert at the Ladies Literary Club here in Grand Rapids. I'd never heard of David Bazan, a Seattle-based indie musician, but apparently he's been performing shows in town for 16 years, throughout all the stages of his career, first as frontman for Pedro the Lion, then as his solo singer-songwriter career developed. Bazan currently is touring with the Passenger String Quartet, a neo-classical outfit of two violins, viola and cello that have backed acts such as Suzanne Vega and Macklemore & Ryan Lewis on tour. They're now on the road with Bazan, playing songs from their new album together. The music cracked my heart open as I sat spellbound, eyes glued to the stage. Bazan's writing deals with themes of faith, doubt and bitterness. He is honest on his website about his struggles with alcoholism and his personal faith crisis from 2006 and beyond. What I appreciate about Bazan is his unwillingness to tidily resolve these struggles in two verses and a chorus. The open-endedness in his music is heart-wrenching but resonant for me, a person for whom faith and joy do not come easily. It's funny to note that despite its deep melancholy, his music brought me so much comfort. I felt, "Yes! This guy gets it. I'm not alone." As he says on his website, "It's like my guts are on display in a museum, and I'm willing to keep paying admission night after night." And who shall I blame for this sweet and heavy trouble? 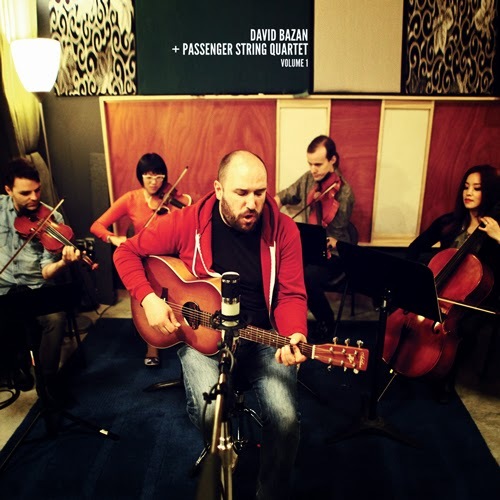 If you like what you hear, you can buy the David Bazan + Passenger String Quartet album on Amazon or on his website. Read more posts in the Groovy Tuesday series here. Short Story: "Mariah at the Holiday Gathering"
Short Story: "A Green Woodland for a Gray Heart"